May Challenges are almost over! There are only a few days left to enter the monthly challenges at The Latte Lounge! The final twist in the May challenges is a polka dotted, flowered card for a special lady in your life. We have fabulous entries so far! Everyone who enters will be in the drawing for each of the five prizes. There are also monthlong challenges in some of The Latte Lounge groups. The Fresh Brewed Designs group is having a sketch challenge. The JLJ Designs group has an anything goes challenge - just use a JLJ Designs product. We'll see you soon. You have until Tuesday to enter the challenges! Only One More Week for the KID'S CHALLENGE!! Kid's Challenge at the Latte Lounge! $10 Gift Certificate to the Stitchy Bear Store! We have a special treat this month too! to post FREEBIES for the Kid's to use in their projects! of the KID'S CHALLENGE page HERE! Mom's you can help open the files for your kids, right? In the first set, there are 5 great images to color! In the second set, there are 6 circles for sentiments! we can't wait to see all your great projects!! Here are FOUR NEW Freebies!! "The Start Of Our Memorial Day Weekend"
Good Afternoon Everyone! Today is the start of the long Memorial Day weekend, YAY! I am sure most of you have plans, either to travel or stay at home and get things caught up or even maybe have a BBQ! No matter what your plans are please be SAFE! I also want to remind everyone to take a few minutes of silence, to pray and thank all of those soldiers out there that either are not with their families for this holiday or who have served in the past, so we all can be free to do what we like! I know that I personally am very thankful for all that our soldiers have done and will continue to do!!! 4th... Heather from Freshly Brewed has her Month Long Sketch Challenge going in her group, if you need a bit of inspiration! She would love to have you join in! This challenge runs until Thursday, June 2, 2011! So now I will bid you farewell, enjoy your long weekend! So, we're nearing the end! June is just around the corner! we have ONE MORE TWIST!! Of course we'll make it worth it! we're going to sweeten the pot! will go into a drawing! What a delicious-looking cupcake, hmmm? My aunt adores lady bugs, so this one's for her! SEE YOU AT THE MONTHLY CHALLENGE!! We had a great Mothers and Special Ladies in Our Lives digi day chat last night! Thank you to everyone who was able to join us. We have four great challenges that are open until Wednesday at 11:59 pm. There are great prizes to be won! I'm going to hit the highlights for each of the four challenges. We can't wait to see your creations! The first challenge is "You're a Special Lady, Too." Make the card or project that you'd like to receive. The challenge is sponsored by Fresh Brewed Designs. I made an altered journal for my project. The image is Summer Laundry Line by The Stamping Boutique. I love this image and I've been using it over and over as we get ready for summer. The next challenge is a Recipe Challenge - 1 image, 2 pieces of lace, and 3 shiny things. You can go totally girly with this recipe! The challenge is sponsored by In a Scrap Creations. Here's Sara's girly card. I love the lace and sparkles! Sara has used Princess Jennifer Latte Vanity from The Stamping Boutique. Stacie's challenge is inspired by her mom - "You Better Shape Up!" The challenge is sponsored by The Stamping Boutique. Here is Stacie's "sunny" card. I love those sunflower seeds. The sentiment inside (from The Stamping Boutique) says "May your day be filled with sunshine." Last, but certainly not least, Rhonda brings us a fancy fold challenge. The challenge is sponsored by Stampin' With Brenda. Here's Rhonda's fabulous tri shutter card. I love the fun flower paper. Rhonda has used Flower Cart by The Stamping Boutique. Digi Day is THIS WEEKEND!! Our May Monthly Challenge is in full swing! that have been entered so far!! from all of our generous sponsors! You’ll definitely want to get in on it!! where we’d would LOVE to see your projects added!! DIGI DAY IS THIS SATURDAY NIGHT!! Saturday is The Latte Lounge's monthly digi day. This month we'll have games and challenges focusing on mothers and other special women in our lives. We'll be having a live chat on May 21st 8-10 pm ET. We hope to see you there! "Late Friday Night... It's The Weekend!" Well, all I have to say is... Whew! Today has been wild! LOL! Anyways, I only have one topic﻿ to remind all of you about (can you believe it?) LOL! I hope you will join me in hopping along and leave all the DT Members some comments! Not to mention... see the NEW May Release Goodies! Yep... Can you believe I (the wordy one) am done already? (Hee-Hee) Must be because I am tired and ready for bed! Have a wonderfully creative weekend! "Drop By And Shop 'Til You Drop!" 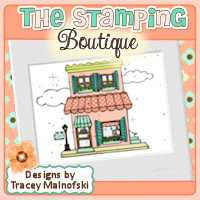 Yep all Tracey's newest images at The Stamping Boutique are on sale for $1.00!!!!!!!!!! You'll also want to check out some of her other wonderful lines available. I have to admit I am pretty much a TSB addict. We hope you'll take time to stop by and see all that she has available!! Don't Say We Didn't Warn You!! We have been very good about posting hints about the May Monthly Challenge at the Latte Lounge, I think! We have told you several times that there might be a few twists along the way! Well, here’s the first one! make any project for Moms and other Special Women in our Lives? projects for Mom’s and other Special Women in our Lives! And we’re STILL being sponsored by The Stamping Boutique! And you can STILL enter your projects HERE! to your Project for Moms and Other Special Women!! Yep, same challenge, but different! but we’re adding to the loot!! We are adding 2 new prizes to the drawing!! A $5 Gift Certificate from Digi’s with Attitude! 3 images from the one and only Glitterbabe!! for chances to win prizes from THREE different sponsors! So keep those monthly challenge projects coming! Enter as many times as you can! The more times you enter, the better your chances to WIN!!! And there are already some beautiful cards that have been entered! with another of the new TSB images!! This one will be on sale tomorrow, too! but isn't this a lovely card? You'll have to pop over to the Challenge Thread to check it out!! Happy Mother's Day! We have so much going on at The Latte Lounge this month. I'm really enjoying the May Challenge - make a project for a special woman in your life. I think there will be some exciting twists with this challenge, so stay tuned for tomorrow! 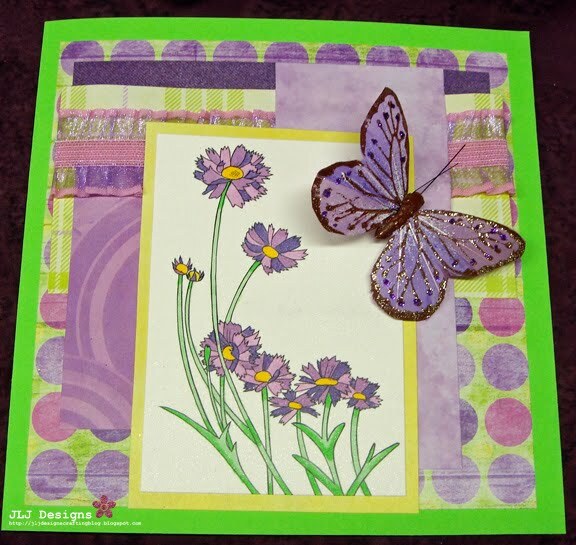 I made a card for the challenge today featuring coeopsis from The Stamping Boutique and Pretty Tough Just the Papers from JLJ Designs. I colored the image with Copics and added ribbon from the April Swap Club. Have you seen our May Kids Challenge? There's even a kids freebie from our sponsor Stitchy Bear Stamps. Check out the fabulous cards that member Jenn made with her card club! Did you know that the Fresh Brewed Designs group has a sketch challenge going on? Heather has some surprises for the group this weekend. So generous! I have one more challenge for you - the JLJ Designs group has an anything goes challenge as long as you use a JLJ Designs product. There's a $3 off coupon good today for group members. Be sure to check it out. Hello and welcome to our THIRD kid's challenge! This one should be pretty special! Sure to make every mom feel SUPER-special! This challenge will run all month! Make sure to post ALL your cards here!! "Yay! It's Friday And Happy Mother's Day To All!" May Monthly Challenge Starts Today!